If there’s one thing I hate to see in an intellectual, it’s smarminess ― even though I’m a prime offender myself. Of course, my status as an intellectual is debatable at best, so I reckon I’m off the hook. I especially hate it when such smarminess exudes from a figure who basks in the near-universal admiration of the public, even while being considered a charlatan by those who know something about his area of supposed expertise. Paul Krugman is a case in point. He’s well-known as an op-ed writer for the New York Times and is a media darling. He is also Professor of Economics at Princeton and won the Nobel Prize for Economics in 2008. Thus, you would be warranted in assuming that the man knows a thing or two about economics. Certainly that’s the way the reading public views him. But even the greatest geniuses make mistakes. And when such mistakes are made, the bigger person will point them out civilly, and in a spirit of correction rather than triumph. However, I am not a “bigger person”. I am a petty man, and I am content to glory in petty triumphs. As such, I would like to triumph in an obscure error Krugman made several years ago, and I would like to do this not in the spirit of correction, but in the spirit of giving the man a little taste of his own medicine. Methinks the great economist is in need of some cutting down to size. Way back in 1996 historian David Hackett Fischer published an ambitiously thick book entitled The Great Wave: Price Revolutions and the Rhythm of History (Oxford University Press). It was very well-received, especially by the business community, which is an unusual honour for such an academic and esoteric work. On the other hand, many academics criticized it, and in fairness with some good reasons. It is a very interesting book but, as with any such work, not without its flaws. Fischer’s impatience with analytical thinking extends to his own ideas; the book contains quite a few whoppers, assertions that fall apart if given even a moment’s serious thought. His discussion of the origins of the great price rise after 1500 provides an illuminating example. Fischer points out, correctly, that prices in Europe began rising well before New World silver began to arrive ― which, he argues, refutes any monetarist explanation. There is no mystery here: as he admits, there was a surge in European silver production in the late fifteenth century, mainly from mines in Bohemia and what is now southern Germany…. But Fischer insists, without evidence, that the rise in European silver production was a result rather than a cause of inflation ― that mines were opened and expanded to meet the “desperate need for liquidity” produced by rising prices.... Think about that for a minute. We can be sure that fifteenth-century mine owners neither knew nor cared about Europe’s need for liquidity ― they were simply trying to make a profit. Now ask yourself: does inflation (a rise in the price of goods and services in terms of silver) make it more or less profitable to open a silver mine? The clear answer is that it makes the mine less profitable: a pound of silver extracted from the mine would buy fewer goods and services than before. Had Fischer devoted even a few minutes to thinking his story through, he would have realized this. Thus Krugman. Now let us devote a few minutes to thinking his story through. Imagine that I own a fifteenth-century silver mine. I hire workers to dig up silver. What do I do with the silver they dig up? Krugman seems to imagine that I spend all of it on immediate consumption, and that since inflation has reduced its value, my silver won’t stretch as far, and so I will not care to mine more of it. But if I don’t mine more silver, next year because of inflation I am able to consume even less than I could have if I had expanded production in the first place. Krugman’s argument is the equivalent of saying that because my $50,000 salary will only be worth $45,000 next year due to inflation, I will therefore refuse the raise my boss offers me. Furthermore, Krugman finds himself without an explanation for why it was that in the following century, miners in the New World flooded the market with silver, thereby contributing to the inflationary environment. Krugman’s fallacy seems unspeakably elementary. The only way to make sense of such a slip-up is if Krugman is assuming a situation in which the marginal cost of further mining is greater than the decline in marginal return. But if this is so, it is an assumption he nowhere states, and it is purely speculative in any case. Furthermore, such a state of affairs could be largely microeconomic in nature and need not have anything to do with inflation per se, which is a macroeconomic phenomenon (although inflation would obviously exacerbate a decline in marginal return). Let us give Krugman the benefit of the doubt (which is more than he bothers to give Fischer). Let us instead imagine, much more plausibly, that as a silver mine owner, I don’t spend all my silver at once on consumption. Instead, like other producers of goods, I sell my silver to buyers. Such an exchange would obviously have to be performed via some medium other than silver. For example, I might accept some other good which I believed I could sell on for more silver than it cost me to purchase it (which is essentially arbitrage). Or I could accept gold in exchange for my silver. And indeed this is precisely why for most of European history there were two metals of exchange in circulation, gold and silver. And because the supply of gold was not tied in any natural way to the supply of silver ― after all, a silver mine is not a gold mine, nor do silver and gold have the same distribution in the earth’s crust ― the silver-gold exchange rate would fluctuate. This is a simple fact of monetary history about which Krugman of all people should have been cognizant. There is yet a further possibility that Krugman doesn’t bother to consider. Again, assume that I am the owner of that fifteenth-century silver mine. I am aware that there is inflation, and so I am considering whether or not to expand my mining activities. It is entirely possible that I might believe the inflation is temporary, or that the value of my silver will rise, and that it is therefore worthwhile for me to sit on some of the silver I extract in the hope that inflation will abate. After all, one of the things that made precious metals the favoured medium of exchange for so long is their non-perishable nature. Whatever way you cut it, Krugman’s errors here seem amateurish, and they are made egregious by the uncharitable nature in which they are expressed. I am aware that I have been just as uncharitable here, but I am frankly tired of Krugman being held up as some kind of omniscient economic sage. I know it might be hard to believe for many, especially ignorant journalists (there's a redundancy! ), but Paul Krugman can’t walk on water. In truth, his work has never really impressed me. It certainly doesn’t seem to impress many professional economists. Perhaps my lack of enthusiasm for his work has to do with the fact that he is an unreconstructed Keynesian, Keynesianism being the equivalent in economics of trying to build a perpetual motion machine. Of course, I’m no economist, but some would say that neither is Krugman. The worst thing about Paul Krugman is that people listen to his half-baked economic nostrums. That’s why I’m frightened by his most recent whopper, advising the US government to adopt a “kitchen sink strategy” ― that is, to throw every bit of money at its disposal at the economy until it improves. This is shockingly stupid and irresponsible. It is unethical to advocate bankrupting future generations to pay for present consumption. It is to commit an intergenerational injustice. In any case, not only has the US government run out of kitchen sinks to throw, but it lacks a pot to piss in. Perhaps I'm missing the point, but I don't see that Krugman made the claim you say he did anywhere in that passage. What I read is that they were trying to make a profit, and that the profits were slimming down year over year. They may have expanded production or not in order to keep pace with inflation, but none the less a pound of silver is worth less from one year to the next. How is that akin to refusing a raise as it will be worth less next year? You make it sound like Krugman claimed that the theoretical silver miner stopped mining entirely as they made less profit, whereas I only read that they made less profit per unit as time progressed, not what they did with that money. Perhaps there's another section of the text you cited that would make your assessment clear, or perhaps you could point out how you think I'm misunderstanding what he wrote. As for the rest of the entry there were a couple other niggley details that bothered me too. Please point out where I am wrong. Now I'm not an Economist either, but as for you assessment of Krugman, why are you calling him an classic Keynesian given that he's modelling this particular response on the Monetarist point of view? Friedman was many things (including at one point a Keynesian), but Monetarism is anything but Keynesian. In addition you state that very few Economists agree with Krugman (and I’m assuming that you meant to imply that this pertains to his writing in the NY Times specifically, not on his speciality of modelling international trade, on which has been very influential indeed). Disregarding your cited example above, I happen to agree with your assessment of Krugman as generally prescribing to the Keynesian point of view, but he seems to have more in common with the Post- Keynesian school rather than the classical one. Because of that I'd say a good chunk of the Post- Keynesian or the saltwater school of economics might very well agree with his views, just as I'm sure that the proponents of Monetarism and the like such as Hayek, Friedman, or Greenspan don't agree with him. But regardless, he is reasonable representative of a pretty big school within modern Macroeconomic theory. Further to that last paragraph; given how exact a science Economics is, I have to say that I'm shocked to discover that there is any form of disagreement between the competing schools, especially as how easily all of these theories are concretely tested, with frequent bouts of re-evaluation in the face of available evidence. It's not like they're dictating some untested superstitions that are rarely re-visited nor properly tested such as Physics or Chemistry. PPS – you forgot your 78's I'll see if I can bring them with us next time we see you. I nowhere said that Krugman was “a classic Keynesian”, although I did say he was an “unadulterated” one, so I suppose you could take that vague qualifier in whatever sense you wish. I’m not sure if prefixes like “neo-“ or “post-“ or “classical” or “neoclassical”, “saltwater” or “freshwater” or whatever really matter for the purpose at hand anyway. Let’s just say that he is broadly Keynesian – that point is indisputable. He believes government has an extensive – nay pre-eminent – role to play in the stabilization and regulation of the economy. That’s Keynesian enough for me. I’m not sure if it’s apt to describe Krugman’s (or Hackett’s for that matter) approach to this particular historical example as either “Keynesian” or “Monetarist”, because the issue is not the proper application of a grand economic theory to a historical example. The issue is at a more general level, having to do with causality and explanatory form. Krugman accuses Hackett of being wrong about causality, whereas, I think it’s pretty obvious that Krugman is wrong, or at least ― more charitably ― less than clear. Furthermore, I’m not sure what’s so “monetarist” (as you infer) about Krugman’s explanation, other than the fact that he’s talking about money. We don’t have enough of either Krugman’s or Hackett’s views on the small story at hand to attach to either one the label “monetarist”. That’s rather a stretch beyond the material at hand in my post. With regard to that material, I will say this: If you and Krugman are correct, then why is it that in the sixteenth century the production of New World silver miners continued to expand despite the fact that they were flooding the market with the stuff, causing it to be worth less over time? Answer: Because, inflation or no inflation, having more money is better than having less. On the other hand, I agree with you that there could be good MICROeconomic reasons why individual miners might stop mining. But as long as marginal return on investment in mining expansion is greater than marginal costs, mining will continue to expand even if the return is declining. I did not say that “very few Economists agree with Krugman”. 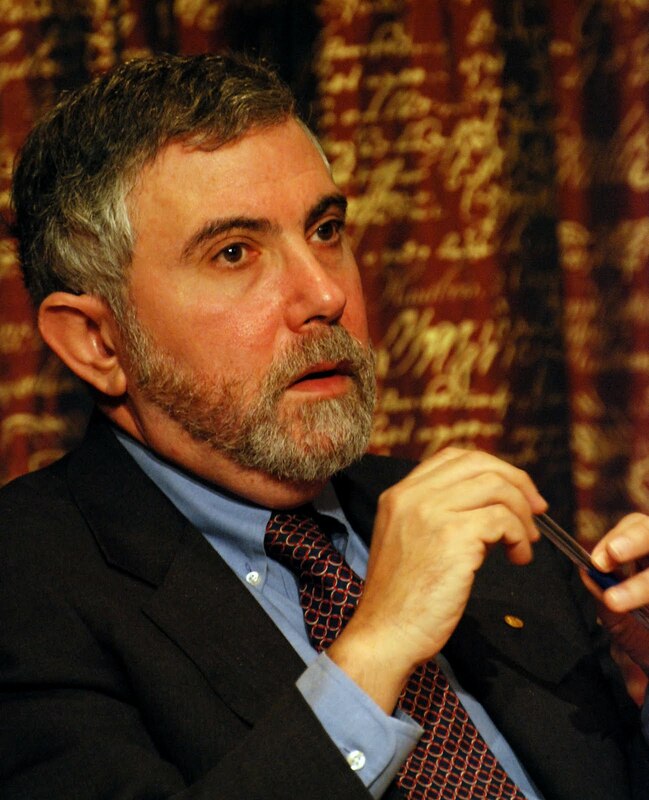 If I was unclear, let me be clear now: MANY ― not necessarily MOST ― economists disagree with Krugman. That is a very different claim from the one you attribute to me. My main point is that enough of them disagree that we should question why it Krugman is listened to with such reverence by policy makers and the non-academic intelligentsia. You say, “given how exact a science Economics is, I have to say that I’m shocked to discover that there is any form of disagreement between the competing schools…” Exact science? I can only assume you’re being facetious here, because, frankly, economics doesn’t match the profile of any exact science that I know of. It usually offers only POST HOC explanations for the phenomena it deals with, and even these are of varying degrees of plausibility (as the debate between Krugman and Hackett demonstrates). Its track record as a PREDICTIVE science makes astrology look reputable by comparison. This is particularly so in matters of macroeconomics. In microeconomics successful predictions are rudimentary and nothing a well-informed businessperson couldn’t figure out for herself. Perhaps it’s the Hayekian in me talking, but the nature of the phenomena with which economics deals makes it highly unlikely that macroeconomics can in principle make anything more than the most rudimentary predictions. In spite of all its pretensions to being a hard science, the inescapable fact is that it’s a HUMAN or SOCIAL science. Having said that, its predictions, however unreliable, are I suppose better than nothing. After all, policy makers have to be seen to be making decisions based on SOME rationale, and as a matter of sociological fact, people prefer policy makers to rely on economic “reasons” rather than, say, astrological ones. The Hayekian in me says that if economic conditions have historically improved at all, this has been IN SPITE of (macro)economists and policy makers. It’s more the doing of people who create economic value (workers, entrepreneurs, and investors) when not interfered with by meddling policy makers and macroeconomists. Hayek would say that, at bottom, all economic phenomena are MICROeconomic in nature. NOTE: broken up into two parts. According to blogspot I'm too wordy. Thank you for the response, and I believe that I need to clarify myself as well. First up: You’re right. I was being sarcastic in the last paragraph. I’m not a believer in any particular school of economics; I tend to believe that any discipline that claims to call itself a science should be able to make predictions that can be tested. I’ve noted that at least as far as Macroeconomics goes, a school of economics comes to the fore every few decades or so. Then an event happens that it cannot explain, and then another diametrically opposed school of economics comes to the fore. The Monatist School of thought (Hayek’s one of the big names here, Greenberg was a fan) is the one currently waning as the recent crash shouldn’t have been possible under its models. However the crash was predicted under the re-jiggered Keynesian models (and Marx’s indecently; but very few economists like to talk about that), so it’s returning to prominence. I agree that Krugman is a Keynesian in the broadest sense, but as a representative of a school that actually predicted and warned about the crash, he gets a boost in public perception. Meanwhile as we might be watching another “changing of the schools”, between Hayek’s view and Keynes’ as Hayek’s Monatist School was shown to not fully cover the existing circumstances. For whatever reason there only seem to be two broad schools of Macroeconomics and they keep changing it up (well, again, there’s Marx too, but polite economists don’t like to talk about him). I believe that it’s that prediction of the crash that is driving the public perception. Personally, I think that most economists (and especially those of the macro kind) are mostly a variant on a grifter, but with more complex sounding language. Granted, some of them know their math too, but even there it’s a surprisingly small number of them given that there entire field of study is based upon a mix of Statistics and Calculus. For the record Monetarism is Friedman’s name for his school of thought. I classify him as belonging broadly in the same school as Hayek. The reason I suggested that Krugman was using a Monetarist explanation was that they view the economy as being all about the supply of money. As the supply of money (Silver in this case) goes up, then so do prices. As more money (or any particular material) is available, it takes more money (or material in the case of barter) to get what you want. It’s any attempt to take the Microeconomic view of supply and demand and apply it to the Macroeconomic sphere. In general I actually find that Friedman’s view makes sense, but as always, his theories have limits. The irony in all this is that in general the very economists who criticize Krugman for asking for more stimulus money to create jobs (and thus drive up the deficit), were also the same ones who demanded that the trillion or so dollars be spent to bail out the banks and financial sectors in the US. Due to that, I tend to view their sudden concern for the deficit the same as many so called fiscal conservatives when they insist that more military spending is good, but it’s too much money to devote a tenth of that to the poor or infrastructure. Finally, I take your point that you didn’t claim that MOST economists deride Krugman, only those that belong to the currently established old guard; who conveniently belong to the opposite school of economics than Krugman. For that, I apologize. However, criticisms that I hear from them seem to be along the lines of “Krugman should give back his Nobel Prize because he said something that disagrees with Hayek, and Hayek got his prize first, so Krugman doesn’t respect the Nobel Prize committee”. That sounds mostly like sour grapes to me. Of course, inevitably there will be a re-tooling of the Hayek school to allow for the last crisis and a newer shinier crisis that the latest incarnation of Keynesian theory doesn’t predict will happen. Then Keynes will be out and Hayek will be back in. Or, alternately, we recover from the current crisis and as the memory fades from the common consciousness, the government will follow the big money boys and return to Hayek. PS – As a side note; I agree that deficits are bad, but the argument that the US hasn’t any more money doesn’t quite make sense as their existing debt to GDP ratio while high, is not the highest it’s ever been. It should be noted that the country didn’t go bankrupt when it did hit its peak either (a little after WW II). It would be bad to push it there, but it’s not that it’s never been done before. I’m agnostic on this point though. On one hand I agree with the argument that more people working means greater revenue stream into the government (via taxes) and the economy in general, and that that money would both stimulate the economy and give money to pay back the deficit . But on the other hand that is a lot of debt. Mind you; I would rather have seen the money spent in this way than on the bailout of the financial system while fighting two wars at the same time. Aaaannnd I realized that I forgot to respond to the central point. If Krugman is saying that the silver miner would actually quit mining versus just saying that the silver is worth less per pound over time. You’re right, and I agree with you. But the point isn’t that I agree with you, but that Krugman isn’t saying that the miners will all quit, just that their product is worth less over time. That’s the sum total of his claim. All he’s pointing out is that when you flood a market with material the value of that material goes down, so you see less net profit. Additionally he’s pointing out that the book seems to state that if you flood a market with a material it will ALWAYS cause people to make (or mine) more of that material, as they are attracted to a market with less net profit. Perhaps I’m a little slow, but I still don’t see how he was wrong in that example you gave, unless you make some assumptions. An assumption such as: if the net profit of an industry goes down less people will invest time and effort in that market, even if the profits in that material were ridiculously obscene in the first place. But that is not stated anywhere in the example you gave. The book makes the opposite statement, as Krugman points out. But he does not say that in the 1500’s, when communications were slow and there were much more regional variation in markets then they are now, that people wouldn’t do a particular activity as long as there is some profit to be made. Okay, where to start. First, you say “the Monetarist School of thought (Hayek’s one of the big names here, Greenberg was a fan) is the one currently waning as the recent crash shouldn’t have been possible on under its models.” Some examples might help here, because every monetarist worth his salt would have seen this coming (as did many people who know there’s no such thing as a free lunch – which pretty much excludes most Keynesians). A typical (though greatly oversimplified) monetarist explanation runs as follows: the improvidence of public finance (a kind of quasi- or perverted Keynesianism) has created too much money sloshing around in the economy. When there is too much expansion of the money supply, a number of very predictable things happen, prominent among which is a misallocation (or “malinvestent” in von Mises’ terms) of capital in suboptimal asset classes (e.g. real estate and mortgage-backed securities), forming bubbles, leading to… etc. I must say, I’m not happy at all with your labeling Hayek a “monetarist”. He had deep and important disagreements with Friedman and other Chicago folks. Your ad hominems against Hayek are rather misplaced, not to mention way over the top -- e.g. your zinger about Hayek and the “big money boys”. Despite my ignorance of many things economic, I know a thing or two about Hayek, and I’ve read just about everything he’s ever written, more than once. I can lend you some stuff is you’d like. I consider him a pretty profound philosopher and social theorist – he went way beyond mere technical economics, and was very skeptical about the pretensions of the very discipline he won his Nobel Prize in (so much so that many were surprised when he won it). Despite surface similarities, there are huge differences between the Austrian School, as represented by Hayek, and monetarists like Friedman. Hayek never had the hubris to believe that economic phenomena are largely reducible to fluctuations in the money supply, even though, like all economists, he had some things to say about the money supply. Again, having something to say about the money supply does not make one a monetarist, or else we’d have to start calling Keynesians monetarists too. You say “the crash was predicted under the re-jiggered Keynesian models...” Again, further explanation might be helpful here, because to the best of my knowledge, it was Keynesian policy makers and a kind of perverted Keynesian public finance consensus that were largely responsible for the crisis in the first place (interesting reading on this are Becker and Posner). Far from predicting it, Keynesians seemed more intent on piling wood onto the pyre. Keynesianism has never been successful at predicting economic crises, though they’ve been pretty good at creating them (case in point: the grim 1970s). Not being a monetarist myself, I’ll happily grant you this: just as there was perverted Keynesianism at work, so too there was some perverted monetarism. That’s what happens when abstract economic policy meets the ugly concrete realities of politics and rent-seeking. A better literature to read up on here is the public choice school of political economy (e.g. James Buchanan, Gordon Tullock). To me they help make sense of what happens when abstract macroeconomic policies are applied in the environment of our public institutions. They understand a grand truth that Keynesians just don’t seem to grasp: government and its agencies are themselves self-interested economic actors; they don’t stand impartially outside the fray acting only for the public good. Thus, when Keynesians try to carve out a large role for governments in the regulation and stabilization of the economy, we should really start worrying. With regard to the “kitchen sink strategy”, your example of WWII is not really to the point. Conditions were very different then. The US had been a net economic creditor, thanks to several years of lending money to belligerents without entering the war themselves. They were in a somewhat similar position to China now. Yes, when they finally entered the war they had to finance the war effort through borrowing, but they had enough assets on the books that they were more than good for it. Furthermore, the debt they took on was almost entirely DOMESTIC, not foreign. It’s not that way today. But even assuming that the US can go on borrowing indefinitely, there’s the sticky issue of the erosion of sovereignty that comes from being deeply indebted to a rival nation like China. And, again, you should take another look at my argument about intergenerational justice: it is simply MORALLY wrong to make future generations to pay for present consumption. I know Keynesians like to claim that borrowing now will make future generations more prosperous, but Keynesianism has never worked that way in practice. Public finance is NOT a self-licking ice cream cone. After several decades of practice, we should be able to start looking to history to resolve economic some long-standing debates, rather than relying on abstract theories. And history is pretty damning when it comes to Keynesianism. And PLEASE don’t say that the problem is that Keynesianism has never been properly implemented: it has been implemented as well as it ever can be. Again, the public choice school is helpful on this point. I don’t have much to add to the silver mining issue. Hackett says 15th century silver miners expanded production in response to increased demand for silver. Krugman says that’s not why they did it ― a purely negative argument. But the fact is, they DID expand production, so unless Krugman can tell us why this is the case, then the better account is the positive one Hackett offers. We both seem agreed that there are good MICROeconomic reasons why individual miners might expand or not expand production. That is not the point at issue between Krugman and Hackett. Both are operating under the GIVEN fact that expansion of production as a matter of fact happened. Maybe they are talking past one another. But even then, Krugman failed to demonstrate that Hackett is as stupid as he implied in his not-very-subtle manner. I'm beginning to think that we're arguing at cross purposes, as I'm basing my discussions more on my reading of modern economic theory, and you are basing them on specifically what Hayek said. That said, let me cop that it's fair to state that Friedman and Hayek had different views; as Friedman’s views are sort of an odd mash up between the Hayek and Keynes (keep markets free, but central banks are awesome) However, the reason that I do lump them together is because Economists do it themselves. My understanding is that Economists divide the schools of Macroeconomics into two schools; Keynesian, and the Neoclassical school. Hayek (along with the Austrian school in general) and Friedman are both considered members of the Neoclassical school. It’s also important to note that the schools of thought that spring from both Hayek and Keynes have been evolving over time; both of them correcting their theories as evidence shows their weaknesses. It's also worth nothing, as it amuses me, that economists like to pretend Marx didn't exist as he is considered a follower of neither school. A good example of this evolution is that the very grim seventies that you mention . Prior to the seventies, Keynesians believed that the long-run level of unemployment depended on government policy, and that it could achieve a low unemployment rate by accepting a high but steady rate of inflation. In the late sixties Milton Friedman and Edmund Phelps rejected the idea of such a long-run trade-off on theoretical grounds, arguing that the only way the government could keep unemployment below what they called the “natural rate” was with policies that would continuously drive inflation higher and higher (which is unsustainable in the long run). Shortly afterwards, a whole troupe of economists presented empirical evidence supporting this view. Since that time the notion of a natural rate of unemployment was folded into what is currently called Keynesian Macroeconomics. It should also be noted that this idea that originated in Hayek’s writings as he argued that Keynesian policies to combat unemployment would inevitably cause inflation, and that to keep unemployment low, the central bank would have to increase the money supply faster and faster, causing inflation to get higher and higher. Keynes won that argument at the time, only to have Hayek proved correct over time. This pattern of one school co-opting a view of the other is observable time after time. For example Friedman is considered very much part of the modern Neoclassical school, but still believe very strongly in the use of a central bank to manage the economy, despite other members of the same school very much opposing the use of a central bank (for example Hayek). Now on to Hayek and Keynes; and fair enough, I’m willing to bet my knowledge of Hayek is not nearly on par with yours. Here’s what I understand about how it works. Within Macroeconomics every school believe that a boom and bust cycle exists and is normal within a working market. The boom and bust cycle is viewed as a bad or good thing depending on who you ask, and how to deal with all this varies too (I’ll go into greater detail with Hayek to make sure that my understanding of his views is not false). First up; Keynes viewed everything though the lens of aggregate demand. He believes that demand is influenced by a host of economic decisions (both public and private) and that the market will sometimes behave erratically. These decisions could be influenced by monetary policy, fiscal policy, news, gossip, etc. Changes in demand will have their greatest short-run effect on real output and employment, but not on prices. As a key point; Keynesians believes that prices, and especially wages, respond slowly to changes in supply and demand, resulting in periodic shortages and surpluses (or boom and bust, if you prefer), especially of labour. He viewed this as a malady, rather than symptom of a properly functioning business cycle. The practical upshot of all this is that Keynes states that in the boom times and the bust times the government should to everything to try to keep these cycles as flat as possible (resulting in an overall reduction of efficiency of the markets, but introduces some level of consistency). So, in the case of good times the government should reduce spending to build up capital reserves, and to pay back any debt that it has accrued, and in bust times the government should borrow and spend as much as possible to reduce the effect of the bust (by replacing the spending that private industry would normally inject into the economy). His belief is that the both the height of the boom and the depth of the bust are destabilizing forces that have a too great an effect on the average member of society, and that it would be morally wrong to allow these forces to affect people’s lives more than they have to. Keynes belief in aggressive government action to stabilize the economy is based on value judgments and on two core beliefs; that the boom and bust cycle significantly reduces the economic well-being of all involved, and the government is knowledgeable and capable enough to improve on the free market (this last statement is something I find dubious). Conversely, Hayek believes fundamentally that market exchange works because people value things differently. Due to that, one of his critiques of Keynes rests on the notion that a planned economy makes the unlikely assumption that everyone can agree what to produce, and how. Instead the price system reflects the imbalance of demand and supply, and it will automatically steer resources to where they are most needed (without the need for planners to discover, understand, and correct the imbalance); an idea rooted in the observations of Adam Smith. To further his criticism of Keynes he also believed that we all do plan individually, and we naturally do so on the basis of our own knowledge of local conditions (and he also viewed such knowledge to be far more useful and current than could ever be collected in a central planning agency). However, Hayek also believed that the market also works due to competition between its various actors. Importantly, Hayek also felt that competition is not a standard process but a dynamic process; in which people constantly search to discover the cheapest mix of resources to produce the most desired outputs. Those that discover the cheapest way to do this “win” the market, but as time progresses someone else will then find yet a cheaper way to do the same thing and replace them. Also key to his beliefs (and his general criticism of planned economies) is that the social order is similar to language. It is a product of human action, but not something that we have deliberately designed. It evolves and changes, but endures because it is useful to us. Just as language is built on complex rules of grammar that most can follow easily (but cannot necessarily articulate), the social order is built on complex regularities in our behavior (law, ethics, customs, manners, etc.) whose importance we only faintly understand. In Hayek’s view the act of attempting one of these grand plans is a “Fatal Conceit”. In fact he felt that totalitarianism occurs when utopians attempt to redesign society according to their rational plan, and that this shows just how little we know about the workings of the complex system of rules on which the social order is based. Under Hayek’s view nothing should be done to interfere with the market. In the case of a crash, any actor that has taken on too much risk should be allowed to fall (I tend to agree with this). This will allow for a market correction that will remove built up inefficiencies from the market. Looking to the zinger, it’s directed at human weakness and at the crony capitalism system that seems to exist today, not at Hayek. In good times the wealthier actors follow Hayek as they can use it to demand concessions to create a less constrained market (lower taxes, less regulations), while in bad times these same actors flock to Keynes to demand help via government spending. The result is that we see government policy that spends in good times (via tax cuts etc.) and then spends in bad times (to prop up the market). I really don’t care which philosophy is used in governing the finances of a nation; but I do wish that it would be consistent. This process of socializing risk and privatizing profits seems unsustainable to me in the long run, and removes the theoretical benefits of either option. As to if the US adopts a standard of nothing but Keynesianism I would argue that they really don't, at least not recently, instead they seem to run on a mish-mash of idea's, more recently primarily influenced by Friedman's theories. For example The notion that that unfettered financial markets set asset prices nearly perfectly at their “true” fundamental value is a very Neoclassical idea. The Fed in the states bought this, and drastically curtailed its supervision of the financial system. Unfortunately, as many officials came to believe this claim, known as the “efficient markets hypothesis,” it resulted in the widespread deregulation of the late 1990s and early 2000s (Also interesting is that both major Macroeconomic schools of thought very much agree that the efficient markets hypothesis is pretty much impossible as no one can know everything – but yet, they went there). That made the current crisis more likely, if not inevitable. The idea that Keynesian theory was tested and was found lacking is very true, although to suggest that the latest incarnation of Keynesian thought was tried is false, and to think that it has been the dominate theory in in the past decade is more than a little unlikely. Most of the recent actions of the Fed seem to have been due to the influence for Friedman and the general supply-side folks, rather than the Keynesian general approach. To add a bit of substance to that argument is to note that Greenspan was in charge of the Fed over much of that period, and he was very much in the camp of the Libertarians. That said – I don’t entirely trust the Keynesian folks to do this either. 1) Both agree that silver mining went down in price per unit, year over year. 2) Hackman states that because of this mining expanded. 3) Krugman says that it did expand, but then says that to claim that it expanded because of the lowering profit is foolish. Whether one is right or the other one is, I don't really know, and I'm not equipped to discuss intelligently (not that this has stopped me in the past). My only point is that your statement that Krugman is claiming that people won't work when there is profit to be made isn't actually something he said. Krugman is calling Hackman stupid, but the fact that he is, in neither a subtle manner nor a nice way doesn't change this. Perhaps my reading comprehension has gone out the window on this one, but I still don't see where he's making that claim. Finally, for examples of people making predictions within the simply accessed public sphere we have Krugman himself (http://www.helium.com/items/1520154-how-to-discuss-economics-so-that-the-public-can-understand-and-react-properly), although it must be noted that Krugman was predicting the crash and the housing bubble since 2002. For the other side, lets assume that the head of the Fed in the States meets your need to be considered an Economist worth their salt (i.e. lets assume that to be considered as such, you don’t need to actually have predicted the crash that occurred), And to add to that we should look at the self proclaimed follower of both Hayek and Friedman; despite his lack of support for the gold standard, Mr. Greenspan who really did not see the crises occurring: http://www.bloomberg.com/apps/news?pid=newsarchive&sid=ah5qh9Up4rIg . More obscure examples are available on request. PS - I hope this makes sense as I still haven't had my coffee. See you at the BBQ. The simple statement of the Keynesian school is that as more people find jobs more taxes will flow into the government. I don’t find that statement controversial. It should be noted that nowhere in that statement is a claim that the new tax revenue will cover the cost of any borrowing, simply that they will get more money. Aaack! Again, I don't know where to begin, and I don't really have any time left to devote to this! You can't just deny historical fact and say you're right. Particularly with the legacy of (quasi)Keynesian policy, the theory has shown itself to be a bad one (not that monetarism has done much better). I don't know any better way to put it. I know all about theory itself, how it's supposed to work, the premises it's founded on, it's belief in the Laffer curve relationship between employment and inflation, etc. etc. etc. When I said I was not an eocnomist, I didn't say I was a complete ignoramus about the topic. Anybody stuck in a Wikipedia loop will lear this stuff by osmosis. What it really seems to come down to is a fundamental disagreement between us about historical facts. We simply won't agree. I think you're wrong, you think I'm wrong. Nothing you've said has really changed my mind the least bit, and I gather I haven't managed to change yours either! To be fair - I never said that the legacy of Keynesian policy was anywhere near a good thing, just that they have been out of power for over thirty years, and that their theories have evolved since then. I'm not a defender of their policy. I simply state that the details you attribute to Krugman, and my own views are no what was actually said. That's it.